That’s right, you read it here. Let’s dispense with the suspense and give you the bottom line of this posting right now; the Naperville city council has too many council members for a city of our size (eight not including the mayor). And we’ve got the numbers to support that bold statement. But before we get into the numbers and open some eyes and hopefully some minds, let’s anticipate some misguided opposition to that statement. Some will say we need 8 city council members because we are growing in population. Well contrary to that sentiment our population has actually declined by about 2% when comparing the last two census figures. Others will say that it’s because we have 8 council members overseeing our ‘success’ that our city has been selected as the best city in the U.S. in which to live. You can lay that one to rest because in the past we were #1, but now we are now #2 within a 10 mile radius of city hall; Bolingbrook has over taken us. Others will say that we need 8 council members because “that’s the way we’ve always done it”. Now that may be the lamest excuse of all. We never had term limits and districts for our council members, however because of a few determined citizens and a massive mandate to vote for term limits and districts we now have them. So it can be done and this is the time to make it happen. To the happiness and giddiness of city council members and local government, they have been able to delay the will of the people until the election of 2015. That’s three years after the world is scheduled to end. The last thing the city council wants to do (well almost the last thing) is to move quickly when drawing up a map for districts. As Mayor Pradel stated, “We’ve got a while to do this.” Unfortunately the legal system is allowing the Naperville City Council to procrastinate which the city council specializes in. But listen close folks…..the city council’s propensity for delaying decisions and actions can now work in the favor of the citizens of Naperville by starting a movement to reduce the number of council members. This could be accomplished easily in time for the next election. We will have five districts and we simply need to eliminate the three at-large ‘floating’ Naperville council member positions. As I said earlier the ‘almost’ last thing the city council wants is to do is draw a map for districts and prepare for term limits. Well the ‘real’ last thing the city council wants is to be reduced in size from 8 members to 5 or 6 maximum. If you think drawing a map is difficult for them, just imagine if city council members thought they could be ‘reduced out’ of the city council. OK let’s take a look at the numbers and specifically compare 8 cities to Naperville. Since each of the 8 cities plus Naperville has a mayor or president of the city council we have not included that commonality into the numbers. So we are looking at the number of council members alone for each city. First let’s compare Naperville to cities with comparable populations which include Dayton, Ohio, Hollywood, Florida, Ft. Collins, Colorado, and Pasadena, California. As you can see those cities have from as few as half as many council members (4) to two-thirds as many (6), and one with one less member. The important metric to notice is the number of residents each city council member of that city represents. Each member of the Naperville city council represents 18,000 residents. Now compare that to Dayton, Ohio where each Dayton city council member represents 38,000 residents; that’s more than twice as many as Naperville. The other three cities represent from 21, 000 each in Pasadena, California to 24,000 in Hollywood, Florida. So why is it those other city councils are so much more efficient at getting the job done than Naperville is. Now let’s compare Naperville with four other cities (Phoenix, San Diego, Detroit, and Seattle) that have a comparable number of city council members (8 or 9). Phoenix, Arizona with a population of 1,446,000 residents has 8 city council members. That equates to 181,000 residents per city council member in Phoenix; that’s ten times more residents per council member than Naperville at 18,000. Apparently the average Phoenix city council member is 10 times better at getting the job done than any of Naperville’s council members. Take a look at San Diego with 8 council members representing a population of 1,300,000 residents which equates to each San Diego council member representing 163,000 residents or 9 times more residents than Naperville’s council member represents. Detroit and Seattle have 9 council members each with populations of about 4 times as many as Naperville. So no matter how you look at it, Naperville has too many city council members. Are other city councils that much more efficient or competent than Naperville is? That sounds reasonable. Is Naperville that much more wasteful than those other cities. That sounds reasonable too. Or maybe Naperville is over represented; isn’t that like being over served in an establishment with a liquor license. If four or five council members can successfully do what it takes 8 to do, then we need to reduce our 8 council members to four or five. Since we are drawing up a district map with 5 districts then 5 council members sounds ideal and in line with what other successful cities are doing throughout the country. Fewer council members mean more efficiency, shorter meetings, less expense, and the public forum can increase from three minutes for each presenter to five or six minutes. What better way to represent citizens than to allow them more time to express their concerns. Like we said initially, the bottom line is that the Naperville city council has too many members. April 19 marked the last Naperville City Council Meeting for this City Council’s members. On May 1st two new members will be added and two will depart. May 3rd will be the first seating of the new Naperville City Council. Now granted 7 of the 9 will still be the same, however whenever you add two new ingredients to a recipe, it invariably changes the flavor the outcome. So the citizens of Naperville will soon have a chance taste-test the new flavor. It’s fascinating sitting in the peanut gallery (general seating) at council meetings because you can see and sometimes hear so much more than if you were looking at it online. When it comes to the distribution of SECA funds (Special Events and Cultural Amenities tax fund), the City Council can’t give it away fast enough, unless it’s late at night at the end of a meeting and the Council members want to get out and get home. At that point the dollars start to fly out. And what’s really interesting is how the council members refer to ‘giving haircuts’ to groups asking or needing support. In other words cutting back on what the recipients need or ask for. Now I suppose using the term ‘giving haircuts’ used in open session is probably far better than the terms they may use in ‘closed’ session, but they definitely do like option of giving ‘haircuts’. During open forum three Naperville taxpaying citizens gave their 3-minute presentations opposing the continuation of the Smart Grid Initiative without the council giving additional consideration to a more desirable wired option. The City Council gave their almost undivided attention, and then you could almost hear their collective sigh of relief when the nine minutes concluded. You get the feeling the Naperville City Council can’t wait for this group to give up their effort, however you also get a stronger feeling that these folks trying to protect our community will not let the Naperville City Council off the hook. You have to admire the perseverance of those questioning the logic of using this wireless technology, when there is no opposition to a wired solution. City Manager Doug Krieger apparently has a very difficult time conveying his thoughts without the annoying use of “uh” punctuating what seems like every other word he utters. I tried keeping track by using hash marks on a pad of paper, but the new pen I was using ran out of ink. I think I’ll bring a couple of pens next time and try it again. A good number of Naperville City Council members wore a bow tie in honor of Councilman Boyajian’s last meeting on the council. 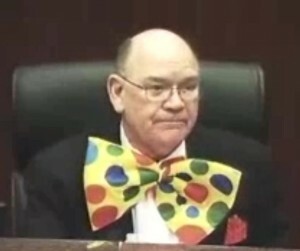 Only two (Councilman Fieseler and Councilman Furstenau) were seen at the beginning of the meeting without bow ties; it makes you wonder if they thought Councilman Boyajian should not be honored, or if they just didn’t read the memo thinking it was just another unimportant concern from some Naperville taxpaying citizen. Even Councilwoman Brodhead was seen wearing a bow tie. And one point during the meeting she had to excuse herself from the topic being discussed in order to not have a conflict of interest. Upon returning to the dais after the discussion you could hear one of the Councilmen say “she looks like a cocktail waitress”. Most companies would see that type of remark as an invitation to require the person making the remark to have a ‘sit down’ with the HR department and schedule some sensitivity training, but this is the Naperville City Council, not a member of their staff. Now I must admit she did look like a cocktail waitress but I say that with all due respect to cocktail waitresses, and Councilwoman Brodhead. During the Awards and Recognition portion of the meeting, Councilman Boyajian was called upon to proclaim May as Vasculitis Awareness Month which is wonderful. But if you’re going to make that proclamation, Councilman Boyajian should at least know how to pronounce the word ‘Vasculitis’. Councilman Doug Krause was runner-up in the Mayoral election, which means he could be the front runner in the next mayoral election. He was proudly seated for most of the session with his bow tie on. If you plan on voting Krause for Mayor, you might want to take this image out of your mind when entering the voting booth. Mayor Pradel proclaimed April 20 as Councilman Richard Furstenau Day, and April 25 as Councilman Jim Boyajian Day. Now we could say that in honor of Furstenau Day you should strike up a conversation with someone on a topic you have absolutely no knowledge about; and in honor of Boyajian Day you could do a verbal beat down on someone but we will refrain from suggesting that in order to not appear ‘mean spirited’. So instead we will wish them both well as they move forward. What about those name plates in front of each council person’s seat..? What happens to them? Is that considered city property? Do both departing Naperville City Councilmen get to keep them, or will an ordinance need to be approved for that to happen? And the # 1 and final observation about this Naperville City Council is that they still can’t seem to start a meeting on time.